A nestorian explaining to us how we're all heretics. And..... False. Swing and a miss Georgy. Well, how could one possibly argue with such incontrovertible evidence as you present. What say all of the wrong idea peddled by some that the Virgin Mary never died but just ascended like Christ to the heavens? It is a key connection to the co-redemptrix business since it allows some to say that a person other than Christ did not need a saviour. You teach the heresy that she did not need a saviour and that she never died because she was sinless. Whether the Virgin Mary was sinless or not is of little concern- but she needed a saviour and she fell asleep after her time was done. Enoch and Elijah will also die when their time comes. Not even true buddy. We teach that she did, in fact, need a savior, and that she did die. Where are you coming up with the nonsense you are spouting? Before anything, you should think about who you're replying to, as someone who doesn't even believe that the One who the Virgin St. Mary gave birth to and mothered isn't God. Indeed. One erroneous doctrine invariably gives birth to a viper brood of them. Before anything, you should think about who you're replying to, as someone who doesn't even believe that the One who the Virgin St. Mary gave birth to and mothered isn't Perfect Man and Perfect God, but instead has 1 nature not distinguishing between the two and disrespecting this sacred mystery. I've always said Perfect Man and Perfect God. You on the other hand deny that the One who the Theotokos bore and raised was God. You have trouble saying it because you separate the natures completely. The hand gestures a unity. We believe in a unity without confusion. "One Lord, One Christ, One is the adoration and worship," I do not worship two, God who dwells in Jesus, I worship One, God Incarnate, and I honor and venerate God Incarnate's Mother, the Virgin St. Mary. May God forgive you for destroying the unity in Christ. 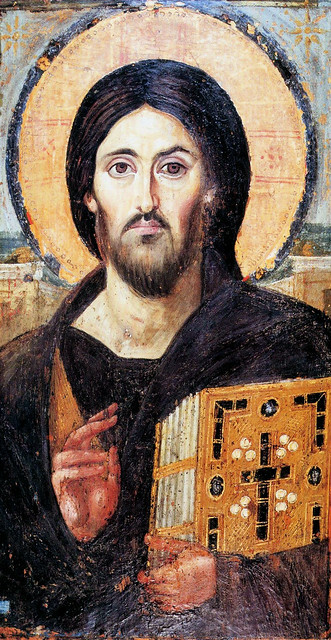 If the hand gestures a unity are you calling everybody in the Eastern Orthodox Church and RCC destroyers of the unity of Christ and that this icon in the Church of Holy wisdom is lying ? No, I'm not saying that the EO's and RC's are wrong. I'm saying that the one finger hand gesture is a valid gesture when understood correctly. For no OO confesses confusion, and no OO attributes to the divine nature human actions or the human nature divine actions, but the properties were shared because of the unity, and that the actions done were not by natures, but by an individual, Christ, the Incarnate God the Word. You cannot as a Nestorian confess sharing of properties, neither do you understand the idea that when you're looking at Christ, He is One. Since everything is two with you, you are essentially putting a chasm between man and His salvation, and essentially you're unable to confess the Virgin as Theotokos. God knows, your accusations against me are clearly refuted by my tradition. Your tradition on the other hand produced unnecessary confused minds and idiocies. You're unable to keep together Christ's unity, and describe Christ in terms no different than any other man who has God dwelling in him. It is blasphemy to the utter extreme. Thank you Deacon Lance. Perhaps Isa had some other document in mind where he did not read this. 14. ...In the same way, it was not difficult for them to admit that the great Mother of God, like her only begotten Son, had actually passed from this life. But this in no way prevented them from believing and from professing openly that her sacred body had never been subject to the corruption of the tomb, and that the august tabernacle of the Divine Word had never been reduced to dust and ashes. 44. ...we pronounce, declare, and define it to be a divinely revealed dogma: that the Immaculate Mother of God, the ever Virgin Mary, having completed the course of her earthly life, was assumed body and soul into heavenly glory. I don't have any document in mind: your Immortalists have read it, and hold their beliefs, and those beliefs are held as acceptible (according to the Nihil Obstats and Imprimaturs I've seen). not by me. Death of the Virgin One final question: Did the Blessed Virgin die? In the climactic paragraph of definition, the pope chose to say, "Mary, having completed the course of her earthly life, was assumed body and soul into heavenly glory" (MD 44). The crucial pharse expleto terrestris vitae cursu offers support neither to those who argue that Mary died (the "mortalists") nor to those who say that she did not die (the "immortalists"). While most of the faithful and most of the writers on the subject accept without debate the fact of the death of Mary, it is a subject of controversy among the theologians....Scholastic theologians such as St. Bonaventure were to accept these explanations for Mary's death and add: (1) the pertinence of virginity, i.e. until Mary's body, which had maintained its integrity even in childbirth, and which was always in harmony with reason and grace, would have merited assumption after death (e.g. St. Bernardine of Siena); (2) the advantage of Mary's meriting herself, by her own death, the resurrection and glorification, as Christ had done (e.g. St. Thomas Aquinas and Duns Scotus). Most theologians of our day are mortalissts and find that the Holy Father, while not taking an ex officio position on the question of the death of Mary, repeatedly used texts from tradition that refer to or imply Mary's death; but a few writers (Bali, Carol, Coyle, Filograssi) have expressed the opinion tha that the Pope's not favoring either side has left the question in the same state as it was before the definition. J. W. Langlinais, "Assumption of Mary," New Catholic Encyclopedia, 2nd ed.. Gale, 2003. vol. 1, pp. 800-1. I'm not sure the Immortalist position is less bizarre than the Mortalists' position here expressed. 46 And Mary said : "My soul exalts the Lord, 47 And my spirit has rejoiced in God my Savior. 48 "For He has had regard for the humble state of His bondslave ; For behold, from this time on all generations will count me blessed. 49 "For the Mighty One has done great things for me; And holy is His name. 50 "AND HIS MERCY IS UPON GENERATION AFTER GENERATION TOWARD THOSE WHO FEAR HIM. 51 "He has done mighty deeds with His arm ; He has scattered those who were proud in the thoughts of their heart. 52 "He has brought down rulers from their thrones, And has exalted those who were humble. 53 "HE HAS FILLED THE HUNGRY WITH GOOD THINGS ; And sent away the rich empty-handed. 54 "He has given help to Israel His servant, In remembrance of His mercy, 55 As He spoke to our fathers, To Abraham and his descendants forever." c) "bondslave" - referring to her sinful nature, to her fallen nature & her insignificance compared to the Lord. b) "im not a bondslave" ? It occurs to me that the ouster of Hosni Mubarak and the potentially world-changing events that are occurring today in Egypt have happened on a Marian feastday: today is the Feast of Our Lady of Lourdes. For those who argue that an event in the Arab world cannot have a Marian component, recall that the Muslim people do honor Mary. And remember that Jesus was delivered to us “for all the people.” His mother, it follows, is for all of us as well. It cannot be otherwise. And there are more things in heaven and earth than are dreamt of in our philosophies…and as my friend Paul points out, it was to Egypt that the Holy Family fled, to safety (Deacon Greg has thoughts on that). As I discover more of these historic feastdays, I’ll add them. Check back! Via Instapundit – it turns out the Shah of Iran was also ousted on this day! Odd. Very odd. When you have some Marian feast or other everyday of the year, it's pretty easy to make such claims. I'm not even sure there is a single parish dedicaatd to the apparition of Lourdes in Egypt. The building of the Wall was hardly a cause for celebration and joy, nor was it in any way symbolic of rebirth, justice and liberation. Wow. It's so nice that this family was murdered on a convenient day for her, so she could use it to help prove the supremacy of her religion. So was that the Feast of Our Lady of Campitelli or the Feast of Our Lady of Victory at Toledo? MSNBC reported yesterday was also the 31st anniversary of the Iranian Revolution and the 20th anniversary of the release of Nelson Mandela from his imprisonment. It also was the day after my nephew's 31st birthday. I'll have to check the back of the dollar bill to see what all of these numerical signs mean. It's neater than splitting open an animal and reading its entrails. Maybe the History Channel has some material for a new earth shattering 'special'. (1) the pertinence of virginity, i.e. until Mary's body, which had maintained its integrity even in childbirth, and which was always in harmony with reason and grace, would have merited assumption after death (e.g. St. Bernardine of Siena); (2) the advantage of Mary's meriting herself, by her own death, the resurrection and glorification, as Christ had done (e.g. St. Thomas Aquinas and Duns Scotus). I think the good news--and maybe I'm being too optimistic here--is that a majority of RCs do not believe in these whacky post-schism beliefs. However, I think the bad news is that a lot of them have not been condemned (at least from what I have seen). Hearing about Medjugorje from friends and professors turned my stomach. Whenever I would mention that the local bishop condemned, it everyone unequivocally said it didn't matter what the bishop said because the pope had universal jurisdiction . When I was down at Tom Monaghan's Ave Maria University, there was more than one professor pushing these things in the Theology department, one of them a Charismatic Benedictine nun who also promoted very whacky apparitions and seers. Of course it can be (and was) all justified with "Development of Doctrine." I wish I would have handed her a copy of "Orthodoxy and the Religion of the Future." Although this is an opinion of one former RC, I believe then and I believe now that they need to condemn and censure all this hooplah. what's disturbing about 3 days of peace and music? Nothing. They have lots of it in North Korea. but is the music as good? Farewell...hope you all remain well. I needed to post that I was actually only an inquirer into the ACOE even though I take sacraments at it and it was told me that there is only one baptism and in a way I already am part of it. I might not be the most qualified defender of the ACOE theology. That co-redemptrix thing is the source of the other bizarre beliefs you mention. I fullly expect that like the IC (which was condemned by the Vatican's doctors when it first appeared) it will be adopted in time, and then be proclaimed to have always been held. The day Rome adopts the "coredemptrix" heresy is the day I go over to your side. That is clearly elevating Mary to a goddess. If the Catholic Church isn't doing it for you, I'd say take the next train out of that station! !...Never stay in a place that endangers your soul! The Church founded by Christ endangers no one's soul. That is true, save for the fact that we live in the world as weaklings. In this case where we are addressing Orthodox and Catholic, from my vantage point, if the Catholic Church becomes a temptation to sin or lapse, then it is better to find a home with Orthodoxy IF there the temptation is not so great or not at all. Wait let me understand this correctly, you Catholics, meaning Mary and Wyatt, are willing to jump ship and head to Orthodoxy if certain heresies become adopted in the Catholic Church? Why not just be Orthodox then and not worry about it? Where is your loyalty? Ahhh...Roman Mariology...I am with Andrew on all this (hi, Andrew) -- I don't know a lot of Catholics who actually believe in all this junk, even among the Latino Catholics I grew up with (their devotion to Mary was also disturbing in many ways, but their understanding of Marian devotion was not the heavily intellectualized "let's-argue-for-this-because-we-can" approach of many RC higher-ups). It is, of course, the height of insanity to suggest the kinds of things that the Co-Redemptrix crowd suggest. I too used to say, like Elijahmaria and Wyatt, that the day that the Pope declares this "Co-Redemptrix" business is the day that I swim the Bosphorus (or as it seems to be going now, the Nile). Then, with no amount of pushing by the advocates of hyper-hyper-hyper-hyper dulia, it became obvious that Isa's position was far more sensible and realistic: Even if the current Pope hates it, eventually it will get there. Heck, it took many hundreds of years for the dreaded filioque clause to go from a local addition at Toledo to something that was always and everywhere to be believed, didn't it? So the Co-Mediatrix pushers will bide their time, collect more signatures on their dumb petitions, and (sadly) have every reason in the world to believe that it WILL happen. It is just a matter of having the right man in the chair. I can only speak for myself, but where did you get the impression that I believe that based on my posts? No dear. I am not saying that any Catholic should "jump ship"...What I do recognize is the fact that my Church recognizes Apostolic Succession and graced sacraments in Orthodoxy. That's a fact and has been made publicly so for several generations now. Both Orthodoxy and the Catholic Church recognize the powerful import of the phrase "for the salvation of souls"...When that appeal is made for good reason, I have never known the Catholic Church to refuse to hear the request and to accede to the request. Some individual priests and bishops might but if you pursue that request there will be eventually someone who will listen. So if a Catholic finds that their participation in the Catholic Church, for sound reason, is a threat to the salvation of their soul, and chooses to leave the Church, it is, as night follows day, logical that they should leave for a Church which is recognized to have Apostolic Succession and graced sacraments. So it is not a matter of loyalty or belief for me to speak of such things. It is a matter of recognizing that some souls have not fared well in the Catholic Church and are now in Orthodoxy. I don't try to judge them by any other kind of criteria...but when they say "I was loosing my faith, and I turned to Orthodoxy"....I am not going to argue with them and I will be content in trusting they are in a safe and graced place, in their spiritual lives and in their Church. There are other kinds of reasons for leaving and moving to Orthodoxy that are not ones that I think very highly of, but I tend to leave those alone...absolutely. They are not mine to judge publicly. Um...okay. So some Orthodox here have problems with your understanding of the "mercy seat". Thank you? Hi all. I'm a new-comer to this thread. Question: is Vassula Ryden Catholic (in communion with Rome, I mean)? From the opening post of this thread I got the impression that she is (or was that just a case of me "assuming" something?) but other things I've found on the internet make it sound like she isn't. From what I understand, she regularly communes at Catholic churches, but she herself has never formally been Catholic. She was Greek Orthodox until she was excommunicated. I would like to give my apologies here to the frankly unkind crazed interpretation I made of Father Ambrose's icon. It may not be my favourite but a "Revelation from Hell" it is not. No, its all bad news, brought by an "angel of light" as what I bold faced says.